After I been to Ayutthaya (Ancient city 2nd capital of Thailand) so many time. I hear people talking about do the biking tour in Ayutthaya and get there by train. It’s actually the whole next level of the way I see it as it use to be. Before we go any further let’s me tell you a bit about this city. Ayutthaya is an ideal destination for those looking for a short trip away from Bangkok, but actually there are plenty of interesting things that you can do here. Besides the old Temples and nice Palace there is also the opportunity to learn more about Thai culture and the life style of the local people who live along the river. You can also ride a bicycle around the historical park. It is just a great way to feel and touch the beauty of the Kingdom of Thailand. This morning we start early by get to Hualumpong main train station. We catch the train from Bangkok to Ayutthaya. It took us around one and half hour to be in the heart of Ayutthaya. On the way we can see the local area where local people live mix with rice field. This’s what you are not going to see if you take a big hi-way road trip to Ayutthaya. Finally we got there late in the morning then we rent the bicycles near by the station. 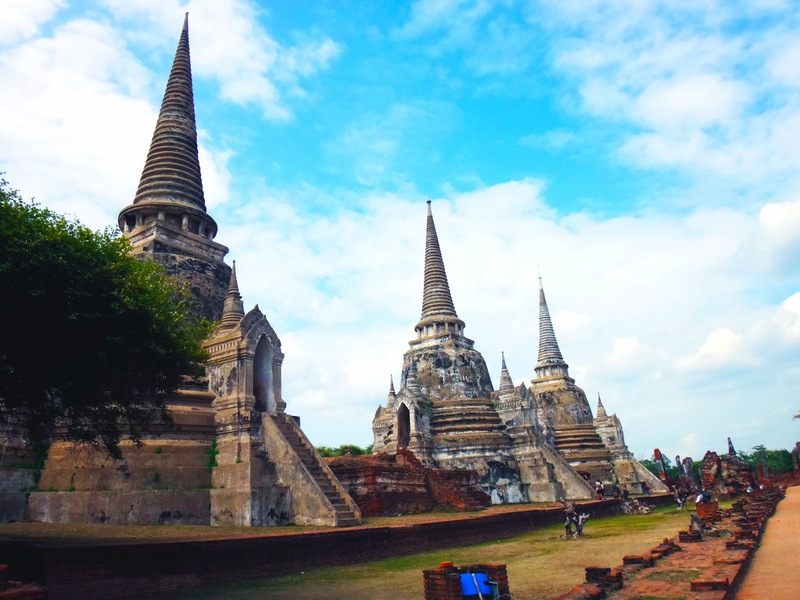 Then continue our journey across the river by took our bite on the ferry and continue our ride to “ Wat Mahathat” which is typical of the Ayutthaya ruins: large crumbling stupas surrounded by low laterite walls and rows of headless Buddha. 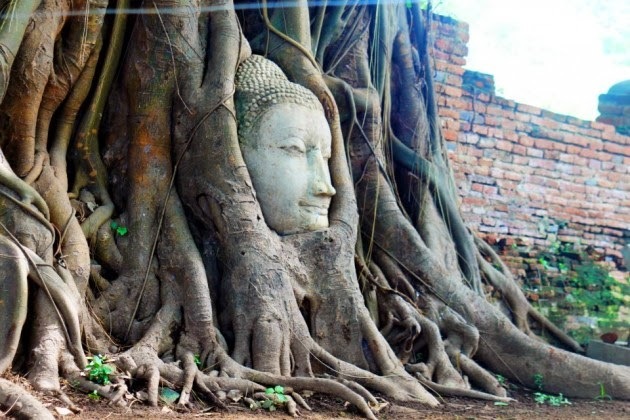 One Buddha-head is in a tree trunk. It’s one of Ayutthaya’s icons that you can’t miss. Then visit Wat Lokayasutharam where you will meet the big reclining Buddha. It is located in the ruins of Viharn and facing towards the East. It was constructed of bricks and cement in Middle Ayutthaya Period and is 37 meters long and 8 meters high. Then visit “Wat Mongkhonbophit” which was a royal temple. Here they have a very famous big meditation Buddha image. And just a few minutes walk we will visit the old loyal palace. where the king use to live and his successors performed religious ceremonies. 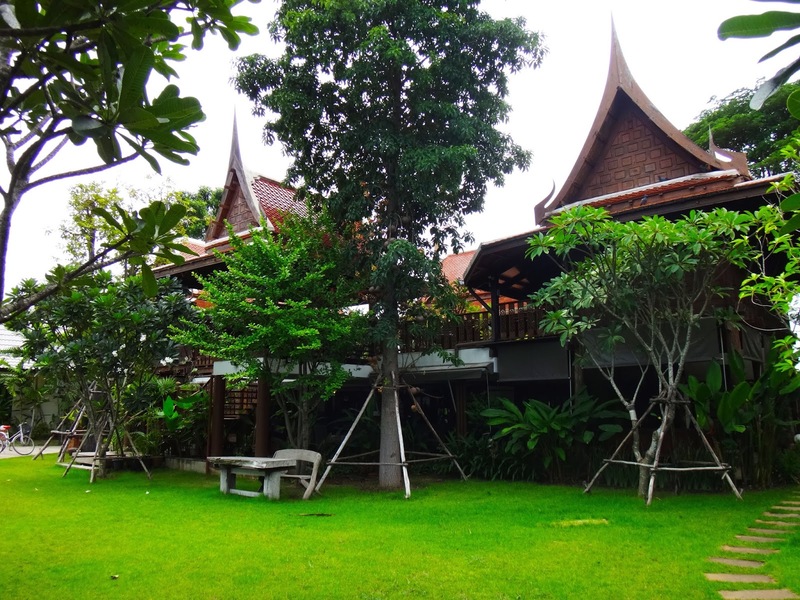 Then check in at a typical Thai house style accommodation surrounded by a canal and beautiful garden. Here you will feel like time is just frozen from Ayutthaya period and tonight if you still feel like you have an energy. You probable go out and have a look of Night view of Ayutthaya at night and check it out for local pub around in town. on land and it’s also Thailand icon. After finish from here it’s just about time to head back to Bangkok. From here we arrange the private car to get back to Bangkok before the rush hour. It’s such an experience that I would never forget.